Vector thin line icon, brick wall between man and woman. Metaphor of indifference, conflict and omni directional. Black on white isolated symbol. Simple mono linear modern design. Husband and wife are having family problem. They fight and quarrel everyday. Their friends try to console them. They are lacking intimacy. They talks to counselor for advise. Relationship is back to good. Family divorce icon in dissolved, dotted halftone and undamaged entire variants. 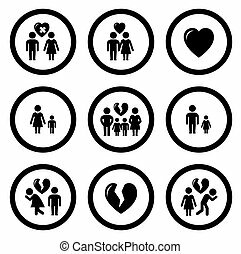 Elements are organized into vector disappearing family divorce symbol. Broken family heart icon in sparkle, pixelated halftone and undamaged entire versions. Pieces are combined into vector sparkle broken family heart icon. 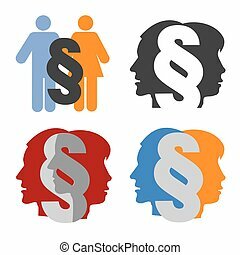 Male and female stylized head silhouettes with paragraph symbolizing family law. Vector available. Unhappy young couple in bed, problems, family crisis. Cartoon design icon. Colorful flat vector illustration. Isolated on white background. Vector thin line icon, brick wall between man and woman. Metaphor of indifference, conflict and omni directional. Colored isolated symbol. Simple mono linear modern design. Vector thin line icon, big family with children parents and grandparents. Metaphor of happy family relations. Colored isolated symbol. Simple mono linear modern design. Vector thin line icon, two people sailing boat. Metaphor of family communication and mutual understanding. Colored isolated symbol. Simple mono linear modern design. Vector thin line icon, problems in couple. Man, not thinking of the family. Metaphor of irresponsibility, indifference. Colored isolated symbol. Simple mono linear modern design. Vector thin line icon, two people sailing boat. Metaphor of family recreation and happy couple. Black on white isolated symbol. Simple mono linear modern design. Vector thin line icon, happy family, husband, wife and child. Metaphor of happiness and humor in family relations. Colored isolated symbol. Simple mono linear modern design. Vector thin line icon, a couch and a puzzle picture. Metaphor of family psychologist or mental treatment. Colored isolated symbol. Simple mono linear modern design. Vector thin line icon, two people in dialogue at the table. Metaphor of family communication and mutual understanding. Colored isolated symbol. Simple mono linear modern design. 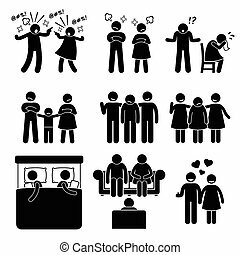 Vector thin line icon, big family with children parents and grandparents. Metaphor of happy family relations. Black on white isolated symbol. Simple mono linear modern design. Vector thin line icon, problems in couple. Man, not thinking of the family. Metaphor of irresponsibility, indifference. Black on white isolated symbol. Simple mono linear modern design. Vector thin line icon, two people in dialogue at the table. Metaphor of family communication and mutual understanding. Black on white isolated symbol. Simple mono linear modern design. Vector thin line icon, happy family, husband, wife and child. Metaphor of happiness and humor in family relations. Black on white isolated symbol. Simple mono linear modern design. Vector thin line icon, a couch and a puzzle picture. 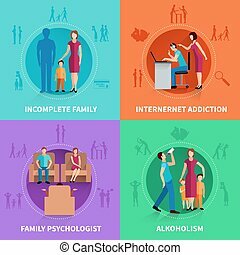 Metaphor of family psychologist or mental treatment. Black on white isolated symbol. Simple mono linear modern design. Vector thin line icon, problems in couple. Man and woman looking in opposite directions. Metaphor of different aims and views, disagreements in family relations. Simple mono linear modern design. Vector thin line icon, vase with flowers and card with word sorry. Metaphor of forgiveness or mutual understanding. Colored isolated symbol. Simple mono linear modern design.